For coverage of Dragon’s arrival and stay at the International Space Station, please visit the Space Station Blog. 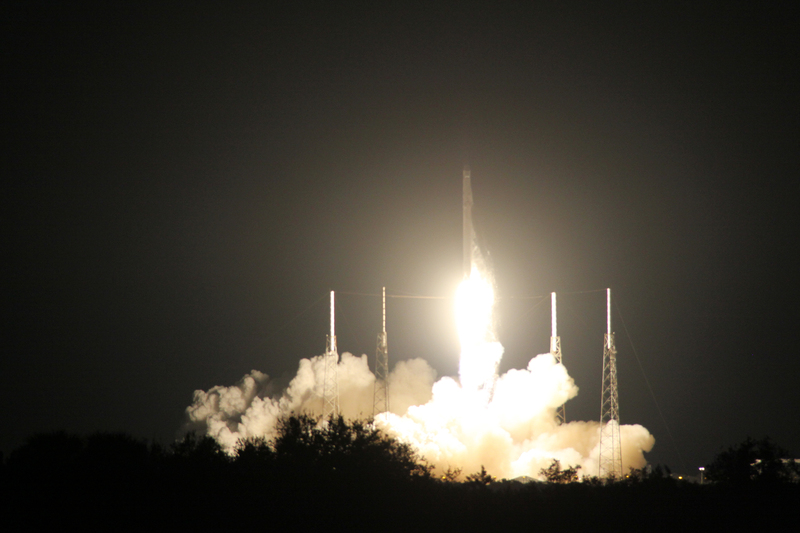 Ignition and liftoff of the SpaceX Falcon 9 rocket. 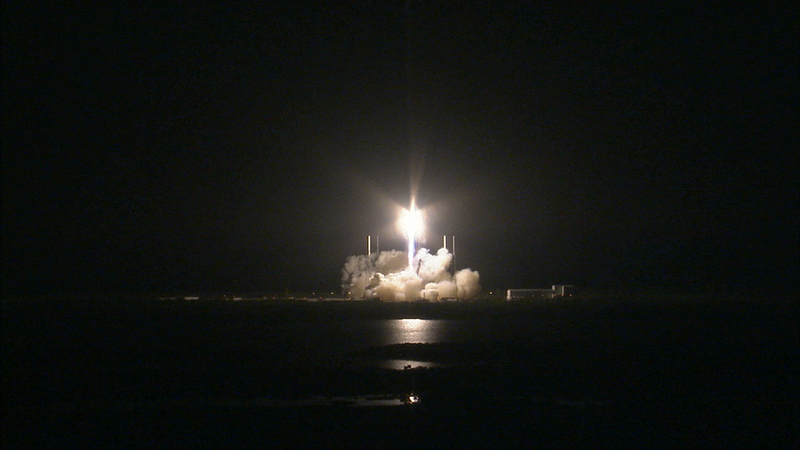 Launch occurred on time at 4:47 a.m. EST. Today’s successful launch of the Dragon spacecraft kicks off a two-day orbital pursuit of the International Space Station. Rendezvous and grapple of the spacecraft is expected to take place Monday morning. Expedition 42 Commander Barry “Butch” Wilmore of NASA will use the station’s 57.7-foot robotic arm to reach out and capture Dragon at approximately 6 a.m. Flight Engineer Samantha Cristoforetti of the European Space Agency will support Wilmore as they operate from the station’s cupola. NASA TV coverage of grapple will begin at 4:30 a.m. Coverage of Dragon’s installation to the Earth-facing port of the Harmony module will begin at 8:15 a.m. The Dragon spacecraft will remain attached to the space station’s Harmony module for more than four weeks and then splash down in the Pacific Ocean, off the coast of Baja California, Mexico, bringing with it almost two tons of experiment samples and equipment from the station. 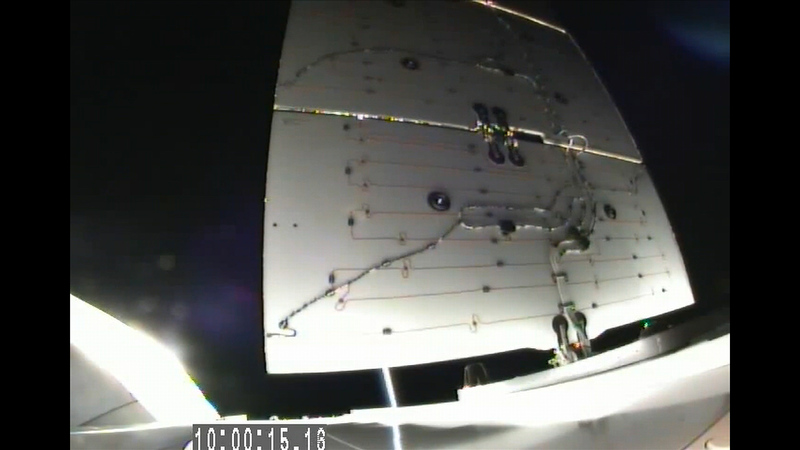 Dragon’s two solar arrays are beginning to extend from either side of the trunk section. The arrays total eight solar panels and produce more than 5 kilowatts of power for the spacecraft. Spacecraft separation! The Dragon spacecraft is flying solo in orbit following an early morning liftoff from Cape Canaveral Air Force Station in Florida. Second-stage burn complete. Standing by for Dragon spacecraft separation.